For the past week, Milton has been waking up Jeff and me around three or four in the morning to use the potty. We don't know if his tummy has just been upset recently or if we are giving him food and water too late in the evening. Milt tends to greatly fluctuate with the consistency of his number twos. Regardless, these bathroom runs are becoming an unpleasant routine for all three of us. It is actually not too terrible though because we no longer have to walk out the door and down a few flights of apartment stairs; now we can just unlock one of the French doors in our bedroom and let the dear boy out. On one of these recent early morning jaunts, Milton returned and decided he did not want to go back to his own bed. Instead, he pawed, clawed, and circled up on one of our decorative pillows on the floor. It was a bit small for him overall but still comfy, I'm sure. We are now mixing a packet of FortiFlora (probiotic) daily with Milton's food. Hopefully that will do the trick in curing his tummy woes. 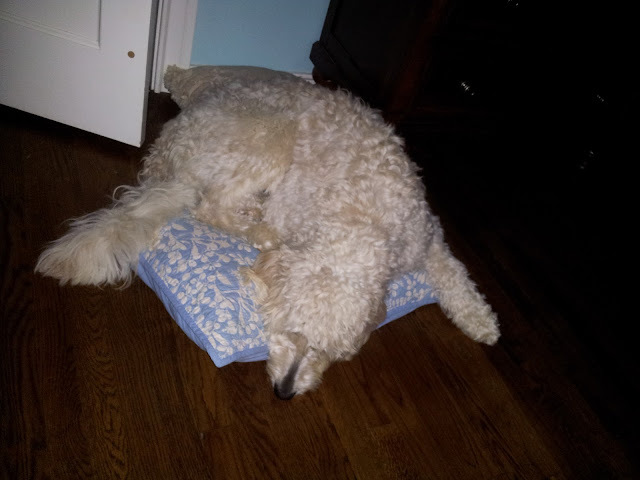 We like our goldendoodle healthy as can be! Wonder if there is a Lady Love involved in his late night jaunts.....Milt, you animal!